Few people have the talent and good fortune to have successful careers in two such diverse fields as professional sports and the film industry. Ernie Orsatti was one of those lucky few. In his nine-year career with the Cardinals (1927-1935), Orsatti hit .300 or better in six seasons, twice hit over .330, and finished with a lifetime average of .306. The Los Angeles native’s colorful wardrobe also lent a touch of Hollywood glamor to the notoriously unkempt Gas House Gang. As successful as it was, Orsatti’s baseball career was really an interlude in a more extensive career in Hollywood. Before he became a professional ballplayer, he was a movie stuntman, prop man and bit player. Then, when his major-league career ended, he and his brothers ran one of the most influential talent agencies in Los Angeles. Ernest Ralph Orsatti was born in Los Angeles on September 8, 1902. He was the sixth of seven children born to Maurizio and Maria (Manze) Orsatti, Italian immigrants whose names were anglicized to Morris and Mary in the US. Employed as a tailor when the couple were living in Philadelphia, after moving to Los Angeles Morris became the owner of the International Steamship and Railroad Ticket Agency. Orsatti’s path to professional baseball was anything but typical. In fact, he had no childhood aspirations of playing baseball. Growing up in Los Angeles, he dreamed of a career in the movies and spent his spare time hanging around the studios and doing odd jobs. “My interest, as a boy, was in motion pictures and not in baseball,” he told The Sporting News. “I wanted to be an actor, a director, a cameraman, anything that would identify me with motion pictures. In 1920, I decided to quit school and devote all my time to the picture business.”1 He went to work full-time at the studios, first as a “gofer,” then as a stunt man. He walked on the wings of airplanes, dived off cliffs, and did automobile and boat stunts. In 1922 Orsatti went to work as a prop man and bit player at the studio of the great silent film comedian Buster Keaton. Though he never doubled as a stuntman for Keaton (who did his own stunts), he did double for the actor in a scene in the 1924 film Sherlock, Jr. At 5-foot-7 and 150 pounds, Orsatti was a good physical match for the 5-foot-6, 140-pound Keaton. A lifelong baseball fan and a decent player, Keaton had an indoor baseball team and was also part-owner of the Vernon (California) Tigers in the Pacific Coast League. Orsatti played first base and caught for Keaton’s team from 1922 to 1925. When Turkey Mike Donlin, a former major leaguer turned Hollywood supporting actor, saw Orsatti play, he told Keaton that the young man could make more money playing baseball than by working in the studio. In the spring of 1925, Keaton walked onto the movie set where Orsatti was working and handed him a contract to play for Vernon. After appearing in six games for Vernon, Orsatti was sent to Cedar Rapids (Iowa) in the Class-D Mississippi Valley League, where he hit .347. It was while Orsatti was at Cedar Rapids that Branch Rickey saw him play and made him part of the Cardinals organization by purchasing his contract.2 Orsatti moved up the Cardinals’ minor-league ranks quickly, hitting .386 at Omaha of the Class-A Western League in 1926 and .330 with Houston of the Double-A Texas League in 1927. The 24-year-old, left-handed-hitting outfielder made his major-league debut on September 4, 1927. Though he showed he could hit major-league pitching (.315 in 92 at-bats), Orsatti was less adept at playing the outfield (five errors in 26 games) and was sent to the Minneapolis Millers of the Double-A American Association in 1928. After hitting .381 with a career-high 15 homers, he was recalled by the Cardinals on August 18. In 1929, appearing in more than 100 games for the first time, Orsatti hit .332 while playing all three outfield positions. He did not play in 100 games again until 1932, when he had his best season, hitting .336 (sixth best in the NL) and driving in a career-high 44 runs. After hitting under .300 (.298) for the first time in 1933, Orsatti hit an even .300 in 1934, then slumped to .240 in 1935. Before the 1936 season the Cardinals planned to send him to Rochester, but Orsatti refused and left baseball. 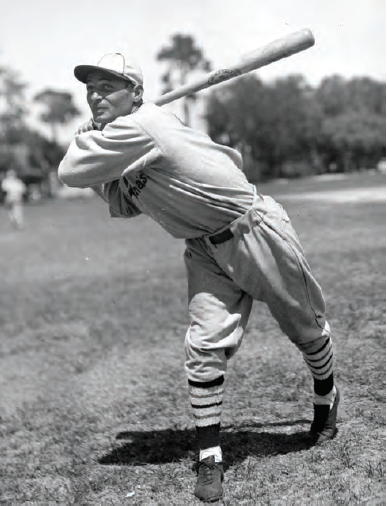 Orsatti’s first four seasons with the Cardinals (1927-1930) came at a time when batting averages were among the highest in history. In fact, three of the top 10 National League averages were recorded in those four years. Still, Orsatti hit well above the league average in every one but the last of his nine seasons. In 1930, when the NL batting average of .303 was the second highest in history, Orsatti beat it by 18 points. And in 1932, his career-high average of .336 was 60 points above the league average. Orsatti himself attributed his limited playing time to the abundance of good outfielders in the Cardinals organization. “In one way, I came along at the wrong time,” he said. “The Cardinals were loaded with outfielders. Every year I’d go to camp thinking I finally had a regular job locked up when some phenom would come along. In 1934, I finally thought I had a regular job in right field. But Branch Rickey drafted an American League retread, Jack Rothrock, who had the best year of his career.”8 Rothrock started nearly every game in right field, while Orsatti started 90 in center. When Orsatti’s major-league career ended in 1935, he returned to Los Angeles and joined his brothers, Frank, Vic, and Al, in the Orsatti Talent Agency.17 According to Orsatti’s son, Ernest F. Orsatti, it was the largest agency in Hollywood.18 Among its clients were such stars as Sonja Henie, Margaret O’Brien, Betty Grable, Judy Garland, and Edward G. Robinson. Orsatti wed for a second time in September 1934, marrying opera singer Inez Gorman in Beverly Hills. The couple had two sons, Ernest F. and Frank. While Orsatti’s own career as a stunt performer was short-lived, his two sons continued a tradition that as of 2013 included four generations of Orsattis. Both sons had long and distinguished careers, each appearing in dozens of films and TV series. In The Poseidon Adventure (1972), Ernie, known as “The Legend,” performed the death-defying stunt of falling from an upside-down table through what had been the ballroom’s ornate glass ceiling. Frank, who died in 2004, worked as Arnold Schwarzenegger's stunt double in The Terminator and doubled for Burt Reynolds for nine years.22 Young Ernie’s son, Noon, has also appeared in dozens of films and TV series since beginning his career in 1983. Noon’s son, Rowbie, and his daughter, Allie, continue to maintain the Orsatti legacy as stunt performers. In 1960 Orsatti married Canadian native Alice Joyce Ritchie. He and Ritchie operated Orsatti Bail Bonds in Van Nuys, California, until his death at the age of 65 of a heart attack on September 4, 1968. He is buried in San Fernando Mission Cemetery, Mission Hills, California. This biography was originally published in "The 1934 St. Louis Cardinals The World Champion Gas House Gang" (SABR, 2014), edited by Charles F. Faber. It also appeared in "From Spring Training to Screen Test: Baseball Players Turned Actors" (SABR, 2018), edited by Rob Edelman and Bill Nowlin. In addition to the sources cited in the Notes, and consulting Baseball-Reference.com and Retrosheet.org, the author also conducted a telephone interview with Scott Orsatti on May 31, 2013. 1 The Sporting News, February 4, 1932: 5. 3 Toledo Blade, April 1, 1972: 16. 5 Frank Frisch, as told to J. Roy Stockton, Frisch: The Fordham Flash (Garden City, New York: Doubleday, 1962), 177. 6 The Sporting News, April 9, 1931: 1. 7 The Sporting News, November 5, 1931: 1. 8 The Sporting News, September 21, 1968: x. 9 John Snyder, Cardinals Journal: Year by Year & Day by Day with the St. Louis Cardinals Since 1882 (Cincinnati: Clerisy Press, 2010), 264. 10 New York Times, September 24, 1934. 11 Leo Durocher and Ed Linn, “That Old Gang Of Mine,” Sports Illustrated, April 7, 1975: 84. 13 Peter Golenbock, The Spirit of St. Louis: A History of the Cardinals and Browns (New York: Avon Books, 2000), 186. 14 The Sporting News, February 4, 1932: 5. 15 The Sporting News, September 21, 1968: 36. 16 The Sporting News, February 4, 1932: 5. 17 Vic, who starred in football and baseball in high school, was honored as the best all-around athlete in Los Angeles in 1923 and went on to play quarterback at the University of Southern California. As the prize for winning a home run-hitting contest while in high school, he received the bat used by Babe Ruth to hit the first homer in Yankee Stadium, on April 18, 1923. Ruth had donated the bat to the Los Angeles Evening Herald. 18 Ernest F. Orsatti, telephone interview, March 7, 2013. 19 New York Times, March 29, 1939. 20 The Sporting News, February 5, 1947: 7. 21 San Antonio Light, February 8, 1934: 17. 23 Ernest F. Orsatti, telephone interview, March 7, 2013.